Here's an idea that is so crazy it is never going to work. 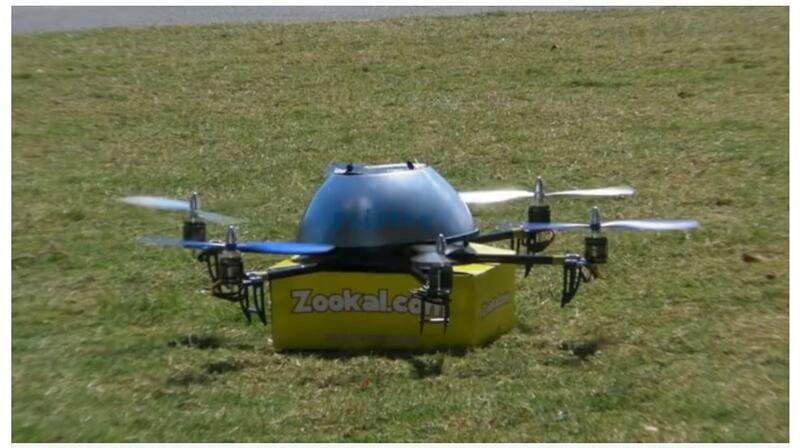 Zookal, a textbook rental startup in Australia, is about to launch a new delivery system: drones. They've partnered with a new startup called Flirtey and plan to start delivering rented textbooks to Zookal customers at Australian universities in the near future. The drones used to deliver the textbook are a little more complex than your average RC helicopter. They were designed and built by Flirtey, and they have 6 motors, a reinforced frame, extra batteries, multiple sensors, and they look like they weight a lot (even without the box full of textbooks). If you believe the hype, Zookal says that using drones to deliver the textbooks will reduce delivery time to only a few minutes. Students will be able to order a textbook from their smartphone and then wait outside for the drone to locate their smartphone's GPS. Once the drone arrives it will hover and lower the parcel through a custom delivery mechanism that is attached to a retractable cord. Real-time GPS tracking of each drone’s location will be available through the Flirtey app for smartphones. Zookal also says that this is going to reduce the cost of delivery from about $9 AUD to under a dollar, but something tells me that once the system is fully operational it won't be nearly as cheap as Zookal had hoped. There's no demo video yet that shows this idea will even work, but Zookal and Flirtey did release a promo video where they pitch the service. It includes a couple minutes with the drone taking off and landing. Flirtey was launched with the goal of creating a drone-based delivery service, and they see this partnership with Zookal as simply the first step. Or at least it will be the first step when (if?) this service goes live in Sydney in March 2014. I say if because Flirtey does not yet have regulatory approval for flying drones in Australian cities. It's also not clear just how the universities and cities are going to feel about having drones flying around while carrying heavy textbooks. But if they do get regulatory approval then Flirtey plans to expand this service to other cities in Australia and also sign up other businesses. I'm hoping they do pull this off, but given the current stigma against drones I'm not sure that will happen. I'm also not convinced the tech is mature enough to support a commercial service, but Flirtey could prove me wrong. I don't have any information on whether any company is trying to launch a similar service here in the US, but I would not be surprised. It's an idea that looks cool and shows great potential. Of course, it's also potentially dangerous; just think what would happen if the drone loses its connection to Flirtey's computers, or if it suffers a power failure. But if this service does launch in the US I will be the first to sign up. My first package will contain a copy of Heinlein's Door Into Summer. While most people would pick Isaac Asimov's I, Robot as the seminal robot novel, Heinlein foresaw semi-autonomous drones being used for all sorts of jobs. If helicopters had been invented just a few years earlier then his fictional robots might even have looked like one of Flirtey's drones. When it comes to the dangers of flying delivery micro-drones, I would worry more about wind gusts and powerlines. Wind patterns in most places are both seasonal and chaotic. And the wind patterns are also unknown – at least on the scale that these drones are operating. They’re liable to lose a lot of drones before they identify no-fly zones. It can get very, very windy in Sydney. This is publicity-seeking nonsense. The distance a book can be carried by a fully-powered drone is around 2 km, and the price is going to be considerably more than $2.50 once all the overheads (no pun intended) are taken into account. The service will be asking students to pay at least $5 for the uncertainly-timed delivery of a book they could walk over and pick up themselves in 15 minutes. And that doesn’t include the labor costs of the recovery team that will be responsible for going around and getting lost drones off of roofs and balconies and out of pools. This sure sounds fishy and unrealistic, but it’s too much of a fun idea not to hope for the best.